While I've kept plot details for the fifth season to a minimum, please be aware that there are some major spoilers for the show's previous seasons. Be sure to check out our reviews for season one, season two, season three, season four, season one (Dolby Atmos Steelbook), and season two (Dolby Atmos Steelbook). Special Features: Audio Commentaries – Twelve audio commentaries with cast and crew including David Benioff, D.B. Weiss, Peter Dinklage, Lena Headey, Kit Harington, Nikolaj Coster-Waldau, Iain Glen, Maisie Williams, Natalie Dormer, Gwendoline Christie and more. "Kill the boy, Jon Snow. Winter is almost upon us. Kill the boy, and let the man be born." Transitions are rarely easy, especially when dragons and undead armies are involved. As the balance of power in Westeros shifts yet again, a queen becomes a prisoner, a little girl becomes a killer, and a young man becomes a leader. And just as the show's characters find their roles changing and evolving, so too does 'Game of Thrones' find itself within an important transitionary period of its own. With the series now (mostly) caught up with the books, the writers have been forced to extend beyond the published source material, taking us into some decidedly uncharted waters. And though the voyage can get a little choppy here and there, the destination is just as thrilling, captivating, and generally awe-inspiring as everything that's come before. But just make sure to stay in the boat... there might be "Stone Men" lurking on the shore. Based primarily on portions of George R.R. Martin's 'A Feast for Crows' and 'A Dance with Dragons,' season five finds the Lannister's control of Westeros in danger as a religious movement called the Faith Militant attempts to seize power in the capital. Meanwhile, Jon Snow (Kit Harrington) and the Night's Watch recover from last season's Wildling attack and prepare for the oncoming army of the dead. And across the Narrow Sea, Daenerys (Emilia Clarke) struggles to maintain power as a dangerous insurgency group threatens her rule -- potentially spelling doom for the "Mother of Dragons" before she even has a chance to fight for the Iron Throne. 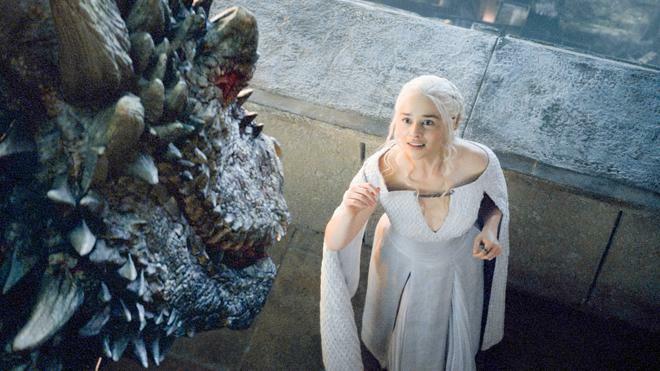 Living up to the series' literary namesake as the "Song of Ice and Fire," season five's most engaging elements mostly involve the chilly adventures of Jon Snow and the Night's Watch, and the sizzling machinations of Daenerys Targaryen and her increasingly large dragons. In the past, both storylines have been guilty of slogging along rather slowly, but here the dual narratives pick up some genuine speed, taking each plotline into some exciting new territory, especially in the last few episodes. Arya and Tyrion's arcs also prove to be season highlights, with the former continuing her distressingly dark yet undeniably riveting path toward becoming a faceless assassin. And the latter? Well, I don't want to give too much away, but Tyrion finds himself in some unfamiliar territory, and as worlds finally collide and long gestating storylines finally intersect, the show is allowed to experiment with new cast dynamics -- resulting in some of the year's most memorable and amusing scenes. Sadly, there are some characters who seem to draw the short straw when it comes to storylines, and certain plot points don't work as well as others (especially in the season's first half). Though it eventually boils to a powerful climax ("Shame! "), the Faith Militant narrative can be a bit dull as it develops, and as presented, it's not always easy to buy how effortlessly the religious leaders appear to seize control of the city. Meanwhile, the writers simply seem to have run out of story for poor Brienne (a potential side-effect of the adaptation process) and her arc involves little more than waiting around for a candle to be lit. Sansa's plot also has some issues, and while Sophie Turner gives a very strong performance, her situation grows so oppressively grim that it becomes rather hard to watch. And then there's Dorne. Good old, strangely meandering Dorne. I have many friends who have read the books who swear that the Dorne story is worthwhile in the source material. I just wish that this was the case on screen. Don't get me wrong, the casting and production designs are strong, fully bringing the southern peninsula to life, but the conflict goes in circles, Jaime is mostly wasted, and the infamous Sand Snakes are severely underdeveloped. With that said, their final bite does imply some pretty big ramifications for next season. Whether that justifies all the grandstanding one has endure to get there, however, remains to be seen. But despite any of these sporadic weak points, the fifth season's final four episodes prove to be among the very best that the series has ever produced, piling upon one huge development and set piece after another, offering more forward progression than several past seasons have had in their entire runs. The endings of episode 8, "Hardhome," and episode 9, "The Dance of Dragons," are particularly noteworthy, providing some of the show's most intense and riveting sequences while advancing the plot in significant ways. The writers have finally run out of (published) source material to work with, and thankfully rather than stall with filler material it looks like they're embracing this fact by going full steam ahead. 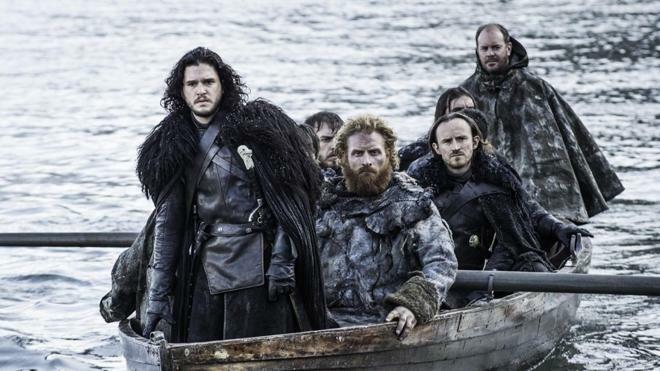 In many ways, season five of 'Game of Thrones' is a tale of two halves -- with the first batch of episodes falling victim to some meandering plotlines, and the last stretch taking on a much more engaging rhythm. Though this does lead to an uncharacteristically uneven season, the highpoints are so strong that they make any occasional flaws pretty easy to forgive… but the sooner we all forget about Dorne, the better. With season six set to premiere on April 24, the show will continue to venture beyond Martin's published works, and if these last few episodes are any indication, then we're all in for an especially cold winter. 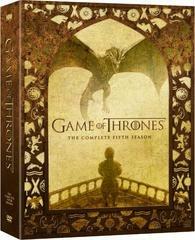 HBO presents 'Game of Thrones: The Complete Fifth Season' in a Blu-ray/Digital HD combo pack. Four BD-50 discs are housed together in an attractive foldout case that comes packaged in a sturdy outer case with a clear plastic slipcover. Instructions for an UltraViolet/iTunes digital copy and an insert with episode details are featured as well. After skippable promos, the discs transition to standard menus. The packaging indicates that the release is region A coded. Finally, despite not being presented in steelbook packaging like the previous Atmos releases, these discs do indeed include Dolby Atmos soundtracks. The show is provided with a 1080p/AVC MPEG-4 transfer in the 1.78:1 aspect ratio. Maintaining the high standards set by previous seasons, 'Game of Thrones' continues to be one of the most visually breathtaking series on Blu-ray. The digital source is mostly clean with a wonderfully crisp, sharp image. With that said, there are some minor signs of compression and false contouring during isolated instances, particularly in darker scenes and around light sources. Likewise, noise does crop up in shadows during murkier sequences. Thankfully, outside of these fleeting technical quirks, the image remains absolutely stunning. Clarity is exceptional with intricate fine textures and detail in every gorgeous location, impeccably designed costume, and painstakingly dressed set. Dimensionality is also very impressive, offering a life-like sense of depth, especially in outdoor scenes. Shots with large crowds are also standouts, including a fighting pit scene where every spectator is clearly delineated in the background. Colors are rich and beautifully saturated with a varied palette that shifts with each location -- casting King's Landing with an appropriately golden hue, various forests with lush greens and browns, and the oppressively bleak Wall with a perpetually blue sheen. Contrast is high with bright whites that don't clip, and deep blacks that avoid crushing. The encode might not be perfect in every shot, but this is a spectacular transfer regardless, just narrowly missing a 5-star grade. Atmos fans rejoice! Like the previously released Steelbook editions of Season One and Season Two, Season Five is presented with an English Dolby Atmos soundtrack. Likewise, a standard Dolby Digital 5.1 track (the default, so make sure to switch to Atmos in the menu) and several foreign language audio and subtitle options are included as well. With that said, I don't yet have a Dolby Atmos compatible system, so for the purposes of this review, the track's Dolby TrueHD 7.1 base audio was evaluated -- and it once again demonstrates why this is one of the best sounding shows on TV. Dialogue is clean and well prioritized, even during occasionally whispery monologues. Like previous seasons, the soundstage is absolutely brimming with detail and texture, creating an intricately layered atmosphere for each and every scene. Whether it's the harbors of Braavos or the fighting pits of Meereen or the courtyards of Winterfell, every region feels like a real and distinct location, marked by ambiance that extends seamlessly around the room with smooth imaging and organic surround use. Of course, the climax of episode eight proves to be the season's real standout, and the battle scene now ranks high as one of the show's most intense sequences with immersive action and deep LFE. It should be noted, however, that I did detect one or two isolated audio drop outs on disc one. Thankfully, these hiccups could not be repeated and were not a recurring problem, so I am not factoring them into the score. With demo worthy sound design and an Atmos audio option for users with compatible equipment, 'Game of Thrones' remains the gold standard for TV mixes on Blu-ray. As fans have come to expect, HBO has put together a fantastic and extensive collection of supplements, including twelve commentaries, a behind-the-scenes documentary on episode ten, and a great look at the series' deep history and lore. All of the extras are presented in 1080p with Dolby Digital sound. Audio Commentaries - Commentaries are provided on episode 1 and 2 with various cast and crew members, including Ciarin Hinds, Nikolaj Coster-Waldau, Gwendoline Christie, and more. The participants share amusing chemistry, and the cast members especially seem to be having fun joking around. Thankfully, it's not all fun and games, however, as the group elaborates on plenty of worthwhile production trivia. Audio Commentaries - Disc Two offers another worthwhile collection of commentaries, this time on episodes 3-5. Participants include stars Natalie Dormer and Iwan Rheon, director Jeremy Podeswa, and several other members of the cast and crew. Audio Commentaries - One commentary is provided on episode 6 and three commentaries are provided on episode 8. Participants include Maisie Williams, Kit Harington, various members of the visual effects team, and more, offering plenty of details on how the epic Hardhome battle was realized on screen. Audio Commentaries - Two commentaries are provided on episode 9 and one commentary is provided on episode 10. 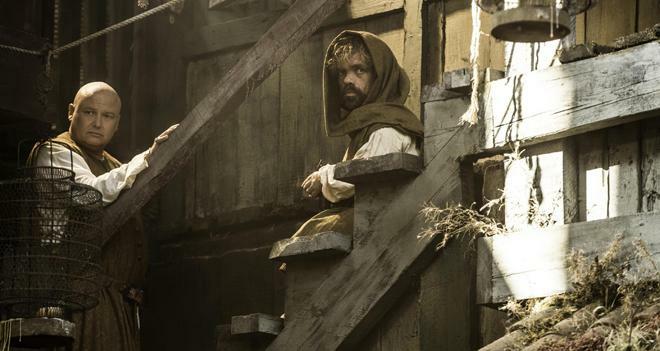 Participants include Peter Dinklage, Ian Glen, Lena Headey, David Benioff, D.B. Weiss, and more. The group discuss the ins and outs of each episode, including praise for the "Great Stephen Dillane" and Conleth Hill's amazing hair, and details on cut lines, directing choices, locations, VFX, and shooting the infamous walk of atonement. A Day in the Life (HD, 26 min) – This is a fantastic behind-the-scenes doc that focuses on the a single day in the show's production across three different countries -- offering a unique look at how the different units shoot different cast members simultaneously. Anatomy of an Episode: Mother's Mercy (HD, 30 min) – This is a comprehensive behind-the-scenes look at the season five finale with cast and crew interviews and on-set footage. The Real History Behind Game of Thrones (HD) – Separated into a Part 1 (18 min) and Part 2 (22 min), these docs feature author George R.R. Martin and several historians as they trace the real history that inspired the series and its characters. Deleted Scenes (HD, 8 min) – Four deleted scenes are viewable separately or together. Though we get a few worthwhile cut moments with Grey Worm, Missandei, Daario, Jaime, Bronn, Tormund, and Alliser, there's nothing especially noteworthy here. Though a bit more uneven than previous efforts from the show, 'Game of Thrones: The Complete Fifth Season' maintains the series' high standards. Some storylines work better than others, but the last few episodes are among the show's very best. The video transfer is exceptional and the soundtrack is demo-worthy. Likewise, HBO has even included a Dolby Atmos immersive audio option. Like previous sets, the supplements are plentiful and informative, rounding out a stellar package for a fantastic show. Despite any minor flaws, this remains one of the best series on TV. Must own.